Whether the items that we buy are mass-produced or handmade, few of us give much consideration to the way in which they are produced. Watching the process of creating a hand painted scarf, however, gives a real appreciation of the amount of time, effort and creativity which goes into every single piece – because these gorgeous accessories are genuine and wearable works of art. The work of the artist must, of course, begin with the design. Inspiration might come from any number of sources, such as from the natural world of flowers or animals, or pieces of abstract art. Wherever they may be, designers are constantly searching for shapes and color combinations to work into the unique pieces that they create. Once the design idea has taken shape in the artist’s mind, he or she will typically sketch it first to get a feel for what the finished product will look like. From here, the design will then be transferred by hand on to the appropriate sized piece of silk, which is first stretched across a wooden frame to provide a flat, wrinkle-free surface. Silk tacks are used to secure the fabric to the frame, and the artist must take great care to adjust the tension so that the silk remains taut. In some cases the silk will be hemmed before the actual design is created on the fabric, and in others this will be done as the final part of the process. 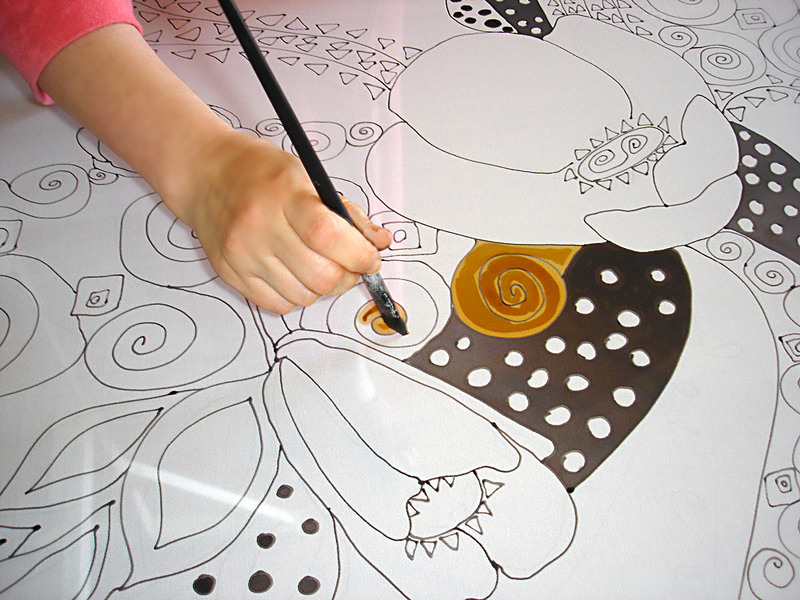 Using either cold wax or other products which act as a barrier for the dyes used to color the fabric, the artist draws the outline of the design. It is not just the very outer border of the pattern which needs to be created, however, but the outline of each block of color, however large or small. 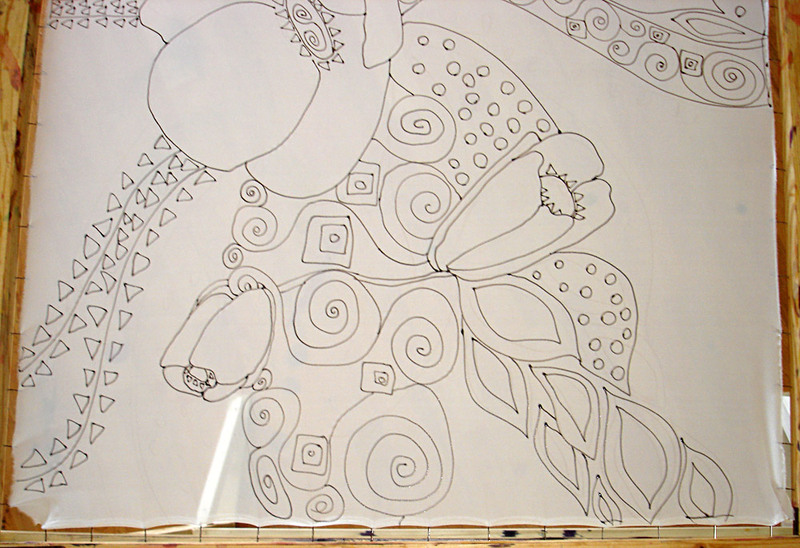 In some cases, rather than draw the design free-hand directly on to the fabric, the artist will first draw a template on paper using a black marker and place this underneath the silk to use this as a guide when applying the wax. When the outline of the design has been created, the wax is then left to dry before the process can continue. Next comes the application of the dyes which are applied using a paintbrush. Working within each of the borders created by the wax, the artist paints on the colors required to build up the design. As the dye touches the fabric, it flows towards the edges of the wax outline and stops. Each individual part of the design is created in exactly the same way and then the background is also colored. After being allowed to dry once again, the entire piece of silk is then carefully removed from the wooden frame and wrapped in cotton before being placed in a special steaming machine for several hours. This process not only removes the wax outlines from the fabric, but it also sets the dyes. The scarf is then washed to remove any excess dye, with the remaining color being both strong and colorfast. So, next time you are weighing up whether to go for the factory-produced silk scarf or the handmade one, just consider how much loving care and attention to detail, and how much talent has gone into creating the unique handmade pieces. You will never want to buy mass-produced again. Silk painters from France and Hungary report that their teachers acquired the skills and techniques of the craft in France from members of the Russian czar’s family. During the Bolshevik Revolution, members of the czar’s family dispersed. However, the roots of this art didn’t die in Russia. WomenClothingToday.com products are made in relatively small town located just 300 km from Moscow. This town is famous all over the world for its textile products as well as its hand painting silk garments. We have very talented team of experienced artists. Each artist develops his own unique approach to design work, an individual process for creating designs and solving design problems. Many designs of silk scarves and shawls are inspired by the work of such famous artists like Gustav Klimpt, Friedensreich Hundertwasser and Van Gogh. Many young, talented surface designers brought fresh ideas into the studios. The new silk collections created at this time reflect the interaction of these designers with the seasoned professionals who already had strong backgrounds in textile design. The studio, the design experience, and the creative and competitive pressure to produce fresh new ideas for the textile and fashion industries were the ingredients needed to develop the medium of silk painting. The network of our artists constantly investigated, explored, and manipulated the technique, sharing knowledge gained through their individual experience, until they mastered and developed silk painting into a versatile medium of artistic expression. I short, the designers at WomenClothingToday, combine elements of traditional cultures and blended with the modern design elements to create elegant and one of the kind silk products. We are committed to producing cutting edge design and the highest quality handcrafted silk clothing. There is no doubt that, we have a great team of designer and artists in WomenClothingToday.com Inc. As a team, we are committed to producing cutting edge design and the highest quality handcrafted silk clothing. All of out artists have their professional education plus all the certification and accreditation to make this beautiful and unique cloth. Moreover, such designers like Svetlana Zavyalova, Elena Nikolochuk, Tatyana Herbakova, Olga Gorbacheva and Tatyana Komplyakova have more than 10 years direct experience in making hand painted silk art. More when 5 times a year; these artists have their own art exhibitions all over the world. It is interesting that, every artist have her own unique ways and techniques of painting on silk fabric. They would prefer not to reveal their secrets, to make their work original and one a kind. In fact, these kinds of hand made designs are non-repeatable by machine reproduction. We also have a few young and extremely talented individuals; for example, Natalya Tahina, Lina Kahina and Anna Galova. These designers are just wonderful in generating new and creative ideas of how to make and produce the silk hand painted garments. The great feature of out designer team it that we never stop in creating new designs and unique garments for our customers. All our scarves, dresses and tops are so unique that in fact we couldn’t even make two precisely alike, even if we tried! We know that all our customers are unique, and we are pleased to be able to offer something that is different and special for everyone. Silk garments which we create are very eccentric, but at he same time they are ease to wear and to take care off. In addition, you can just enjoy how beautiful they are, and how much love are inside them. Every artist and designer in out team is really like what she are doing for her life and always tries to master her skills. That is why every silk garment we create is a piece of art. About the Author: My name is Anton Zavyalov, and I represent www.WomeClothingToday.com the online business, specializing in custom hand painted women clothing. All silk garments we create are designed by our own artists and designers. We are offering you the exclusive, unique and stylish collection of gorgeous silk cloths that you can’t find anywhere else.